After attempting the knotted outline stitches, I decided to try out some simple (and common) stitches for outlining - back stitch , running and whipped running stitch. The center is in running stitch, the inner layer is in back stitch and the outer layer is in whipped running stitch. My back stitch is not perfect - most of the time I miss going in back at the same place and it leaves a teeny weeny gap between the stitches. That's something to be careful about next time. I like the whipped running stitch for its simplicity and the contrast effect it produces. 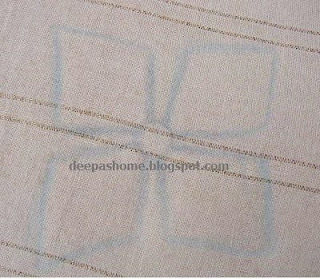 By the way, you can whip stitch other outlining stitches too. I also tried out the double back stitch for outlining the center of one of the flowers.The double back stitch is usually used in shadow work to produce a beautiful shadow effect. Hi Deepa! Came across your blog just by chance. Kudos to your creativity! Your instructions and illustrations are also real good. 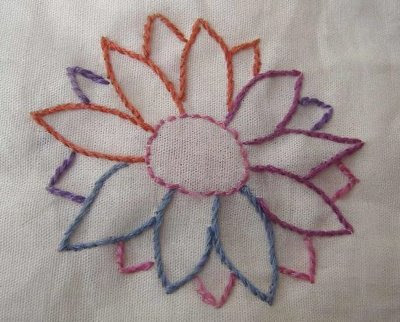 The double back stitch flower outlining is too good, especially the colour combination! Can you please post some instructions on how to do it and what colours you have used? 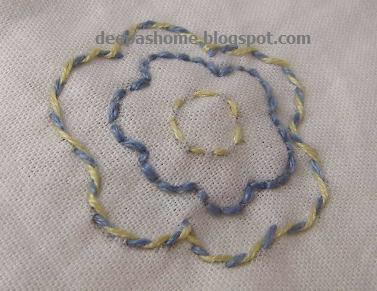 I've provided the link for the double back stitch stitch instructions in the post itself.Just click on the green color text.I've used it only for the center of the last flower,the remaining outlining is stem stitch and outline stitch.